Nicholas Angelich, piano; Laurence Equilbey, Insula Orchestra. Erato 0190295634179. I don't know how the rest of you keep up. 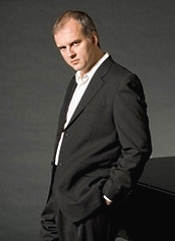 American pianist Nicholas Angelich (b. 1970) has made some two dozen albums already, but the only things I could remember were his Brahms piano concertos, maybe because I reviewed them. In any case, he's been playing piano since the age of five and done concerts throughout the world, so all that practice apparently pays off. He's very good. 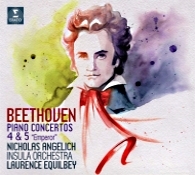 Here, he presents Beethoven's last two piano concertos, Numbers 4 and 5. When Beethoven was writing his nine symphonies, they seemed to become monumental in size and scope very fast with his third. But with his five piano concertos, they sort of built up incrementally, with No. 4 being impressively large and No. 5 being monumentally impressive. The album begins with No. 4 in G major, Op. 58, completed in 1806 (around time the composer wrote the Fourth Symphony and parts of the Fifth Symphony). Beethoven made the opening movement melodic, with the piano part often sounding improvisational. He then scored the slow movement for piano and strings, keeping it fairly poetic, with a slightly agitated orchestral accompaniment, leading quietly into the concluding Rondo: Vivace. With that, we get a passionate, tempestuous, rhythmic, stormy, yet graceful final movement; you name it, Beethoven threw it in. Angelich's dexterity at the keyboard is on full display in the Fourth's opening movement. He nimbly glides through the music, making it all seem effortless. He uses a Pleyel piano from 1892, a good compromise between what Beethoven might have heard in his own lifetime and what we have today, and the orchestra tries to remain true to the spirit of Beethoven. The piano resonates clearly and richly, if perhaps not quite as smoothly as a modern instrument. Anyway, Angelich makes the whole concerto sound full of strength and élan, meaning he makes the work appear both extemporaneous and elegant at the same time. His playing is filled with a vigorous energy and a lyrical polish, with maybe a greater emphasis on the former, especially in the fleet-footed finale. Beethoven wrote his Piano Concerto No. 5 in E Flat, Op. 73, "Emperor," in 1809, premiering it in 1811 and dedicating it to the Archduke Rudolf, his patron and student at the time. The piece begins with a big, bravura Allegro, the piano entering immediately. In the central Adagio we get one of the Beethoven's loveliest melodies, a brief duet between piano and orchestra. Then there is a hushed transition into the final Rondo: Allegro, which takes the concerto to a glowing conclusion. Beethoven intended No. 5 to sound monumental, as I've said, although the smallish size of the Insula Orchestra (about forty-six players) under Maestro Laurence Equilbey tends to make it more transparent than plush or weighty. Still, it holds its own. Angelich's high-octane delivery is well suited to the first movement of the Fifth Concerto, even if it tends to dominate the orchestra more so than usual. Conductor and pianist keep the tempos on the urgent but not strident side, making for some exciting moments in the first and third movements. As for the beautifully meditative middle movement, it's fine, even if it's not as beautiful as Wilhelm Kempf's (DG) or as meditative as Stephen Kovacevich's (Philips). Angelich seems a little too matter of fact by comparison. Producer Laure Casenave-Pere and engineer Thomas Dappelo recorded the concertos at La Seine Musicale, Boulogne-Billancourt, Paris, France in March 2018. The sound of the piano and orchestra is generally refined and well balanced, if both appear a touch close. The highs are slightly rough, perhaps due to the closeness of the miking. Nevertheless, I particularly liked the realistic reproduction of the piano, which recreates a lifelike illusion. While the stereo width is more than adequate, the perception of depth is somewhat limited, making things not only a tad close but one-dimensional as well.